SYNOPSIS: The drama heats up, both on and off the volleyball court, as the rivalry between teammates Shoyo Hinata and Tobio Kageyama continues to develop in new and unexpected ways. After the team's dramatic setback in Inter-High Preliminaries, Karasuno gets the unexpected opportunity to go to a training camp in Tokyo alongside other top schools in the nation... including their rival team, Nekoma! In order to attend, though, the dynamic duo must pass their exams, and getting Hinata and Kageyama through that challenge will be the trial by fire for Hitoka Yachi, who could be joining Kiyoko Shimizu as a team manager. With the eyes of their opponents fixed on their progress, will it be the spark needed to get the team moving in the right direction? Passions burn, and tempers flare as the fuse is lit for HAIKYU!! SEASON 2! SYNOPSIS: Just as Tsubomi is getting ready to start the fifth grade, everything she thought she knew about her life suddenly starts to change. Not only has her mother just told her that she's about to become a big sister, but Tsubomi's been starting to feel a little strange herself and it seems that there's a lot more to growing up than she thought! Unfortunately, people's bodies don't come with owners' manuals, so Tsubomi will have to rely on advice from her friends at school and most of them don't know any more than she does. (Some of them are even BOYS!) Fortunately, there's that mysterious new transfer student, Saya, who seems to be a bit more knowledgeable, and with some help from Mom, Tsubomi just might make it through adolescence unscathed in NAISHO NO TSUBOMI! SYNOPSIS: As an unexpected typhoon bears down on a small tropical island, a group of students trapped at school find themselves forced to put aside their personal issues and work together. Not only to save themselves, but possibly the lives of everyone on the planet! Because there's something very strange about this storm, and as the driving rain, hurricane-force winds and multiple lightning strikes threaten to tear their world apart, everything seems to revolve around a mysterious girl who appears as suddenly as the storm itself. Only hours before, Shuichi Azuma and Saijo Kunta were at each other's throats over baseball; now they'll have to join together to unravel the secret of the ultimate rider on the storm in TYPHOON NORUDA! SYNOPSIS: Tanaka-kun can't help it. Put him someplace nice and warm, and he'll start nodding off, even in class or on the way to school. You would think that this would eat into Tanaka's social life, but, fortunately, our consciousness-challenged protagonist has a guardian angel in the form of his best friend Ota, a gentle giant who (literally) carries Tanaka from place to place. Then there's class-rep Shiraishi, who's convinced that Tanaka's unique perspective lets him see past her beautiful appearance; Miyano, their hyper pint-sized classmate who somehow becomes Tanaka's unwanted apprentice in listlessness; and Echizen, a self-proclaimed delinquent who's determined to fight him. 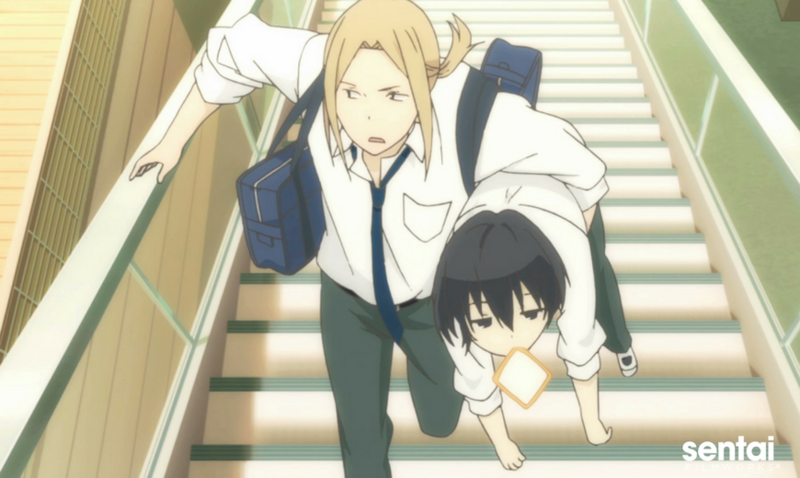 As for Tanaka, being the center of attention is the last place he wants to be, but the world just won't leave him alone in TANAKA-KUN IS ALWAYS LISTLESS.